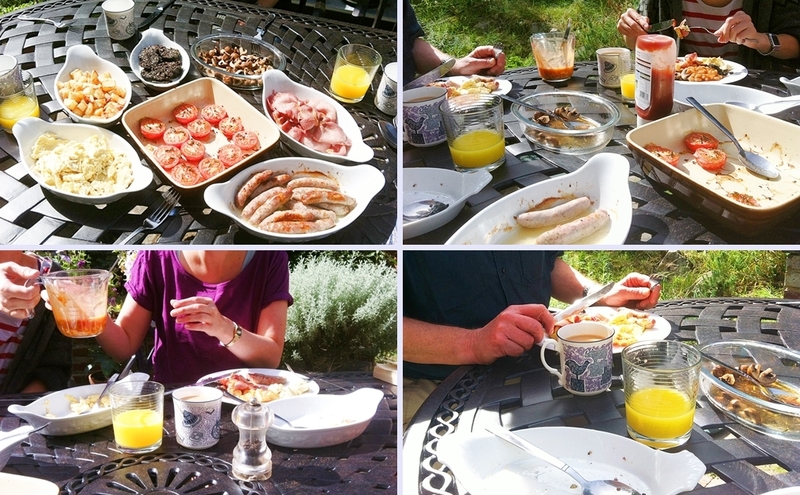 At the weekend I decided to do a ‘Full English’ Sunday breakfast. The ‘works’: ‘fried’ potatoes; bacon, sausages, black pudding, mushrooms, tomatoes, baked beans and scrambled eggs. Most of this was not fried at all. Starting with the potatoes (old), I peeled and diced them, and put them into a pan of cold water. Once this was brought to boiling point, I drained the potatoes, and put them back in the pan over a very low heat (without a lid). Over the next 5 minutes I occasionally shook the pan (with the lid on). This made them ‘floury’ (and hopefully more crispy). Next, I put them in a roasting dish (already in the oven (190C) to which I had added goose fat (one scoop with a tablespoon (left over from Christmas)). They would cook for the next 40 or so minutes (turning them over halfway through). The sausages and black pudding (skinned and sliced) were arranged in an a small roasting dish (the black pudding sprinkled with olive oil) and put into the oven about 10 minutes after the potatoes. This proved a mistake – surprisingly, water was the second ingredient in the Waitrose (assumed ‘high quality’) chipolatas and it fled the sausages on cooking (I had to drain the ‘puddle’ from the dish to continue cooking them). On reflection these would have been better spread out on a baking sheet in the oven (the water would have evaporated more easily), or grilled. The black pudding cooked in no time, so I arranged it on a serving dish, for reheating in the microwave at the last moment. The mushrooms were washed and quartered and put in an oven-proof dish with olive oil, thyme and black pepper sprinkled over them. 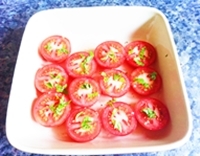 The tomatoes were washed, halved and put in an oven-proof dish with olive oil, basil, lemon juice and black pepper. Both were put in the oven (uncovered) about 5 minutes after the sausages and black pudding. the mushrooms needed stirring/turning over halfway through). 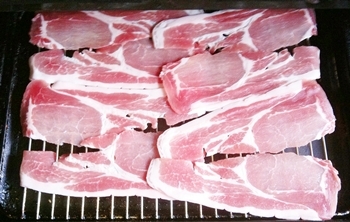 I grilled the bacon shortly before the potatoes were ready, and at that point lowered the oven temperature to about 120C, and kept it warm in its serving dish in the oven. Finally, I broke the eggs (6 for four people) into a Pyrex measuring jug, added about 4 tablespoons of water, and some black pepper, and the poured the beaten mixture to a hot frying pan with a large nob of foaming butter. As the egg solidified in the pan I broke it up with a fork. Once the whole lot was nearly cooked, I turned off the heat and left it to briefly finish cooking (using its own heat). Meanwhile the baked beans had been heated (in another Pyrex measuring jug) in the microwave (about 3.5 mins for a standard tin at 750W) and the black pudding had been reheated. So we were ready to go. A lot of effort, a lot of enjoyment – then it was gone. Still Sunday Lunch was unnecessary that day!